The Maine Sportsman - New England's Largest Outdoor Publication – Has assigned me as the writer for the magazines monthly Washington County Report. The column will highlight seasonal hunting, fishing and outdoor activities in Washington County, Maine. The copy below is the originally submitted unedited version. Enjoy! Go Round to Get Kids Fishing With free-fishing days taking place February 16 & 17, please remember to take time to introduce a child or someone new to ice fishing. To accomplish this goal, Washington County offers Round Lake, as an easily accessible option, offering descent fishing opportunities. Located between Meddybemps Lake and Pennamaquan Lake, Round Lake offers several access points, including a boat launch at the North end of the lake on Oscar Brown Lane. Numerous parking opportunities also exist along the Charlotte Road, where fishing is possible by simply parking and walking about 50 yards to the lake. The maximum lake depth is only 14 feet, so use care when drilling holes, as you can run into bottom fairly quickly. The lake deepens the closer you get to the middle, so be sure to check depths. It is not however necessary to walk a long distance to reach good fishing and many anglers have watched their ice traps from the warmth of a vehicle on bitterly cold days. Anglers can expect to catch brown trout, brook trout, small mouth bass and pickerel from this 558 acre water body. Look for Round Pond on DeLorme’s The Maine Atlas and Gazetteer (MAG), Map 36, D-5. As February arrives, the hard water season reaches its full crescendo, sending many ice-fishing veterans on their annual migration to West Grand Lake, in pursuit of land locked salmon and trophy size lake trout (togue). Be forewarned, however, for this lake does not easily give up its bounty. Ice fishing West Grand Lake, typically requires snowmobiles and equipment not within the budgets of every weekend ice angler. Additionally, pressure ridges, fickle weather and long travel distances, to prime fishing locations, make West Grand Lake fishing an expedition for the well-seasoned and well-prepared outdoors person. Those with the necessary equipment and up for the challenge will certainly manage to catch their share of 15- to18-inch salmon and 19- to 22-inch togue. Larger fish certainly inhabit the lake and every season, a few lucky anglers come home with trophy size specimens. Fishing around the shores of places like Hardwood and Marks Island provide good fishing and when the bitter winds blow, offer partial protection from the elements. Classified as a noble game fish, the salmon enjoys sport fishing stardom, never afforded the humble togue. Referred to locally as “mud” trout, togue lurk in the shadows of other more popular game species and only by landing a true 15- to 20-pound monster, ever provided the recognition it rightly deserves. Barely palatable, oily and fishy, to me describe togue and despite trying a plethora of recipes over the years, not one has ever appeased my tastes. For me, making togue edible requires salt water brining and smoking its flesh over hickory chips. This process ultimately removes any hint of fishiness and creates a mouthwatering breakfast when paired with cream cheese and bagels or a delectable mid-afternoon snack stacked with a small hunk of cheese on a cracker. While old silversides typically beats mud trout on the rod and reel, a taste test of smoked salmon versus togue will yield a majority of pallets declaring togue the clear winner. While preparing salmon for the smoker only requires a simple brine of 1 quart water, 1/2 cup white sugar and 1/2 cup non-iodized salt, togue need a more complex marinade. For best results, mix 2 quarts water, 1 cup of non-iodized salt, ½ cup of brown sugar, 1/4 cup of lemon juice, 1/4 tablespoon of garlic powder and 1/4 tablespoon of onion powder. Togue should be soaked overnight in this mixture, removed, pat dry and allowed to set 15-20 minutes before being placed in the smoker for 8-10 hours. Look for West Grand Lake on DeLorme’s The Maine Atlas and Gazetteer (MAG), Map 35, B-3 and B-4. For dedicated sportsmen, the winter season means a relentless pursuit of coyotes. With Maine’s low deer densities, this activity ranks high on everyone’s to-do list. While a noble endeavor, I also enjoy occasionally hunting red fox. 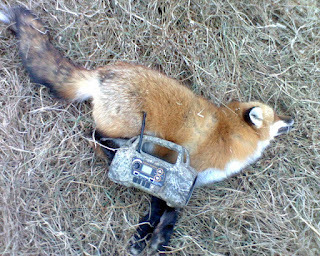 Pursuing red fox offers a different scenario to coyote hunters looking to enjoy a higher rate of success. While certainly no dummy, red can typically be more easily duped than this larger cousin the coyote, making shot opportunities slightly more plentiful. Fox season runs from October 15th to February 28th, affording predator hunter’s ample time to harvest one of the truly beautiful canines. Attention should be paid to blending into your environment and this time of year, snow camouflage is king. For those not looking to spend a fortune, military surplus stores offer budget priced white nylon cover suits or in a pinch, white painter coveralls from Home Depot work quite well. 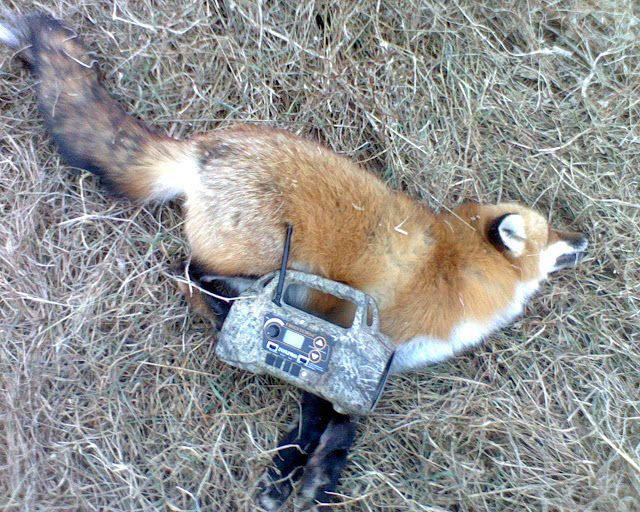 Electronic calls, set on low volume and transmitting the sounds of a wounded field mouse, crying rabbit or kitten usually bring old red running within minutes. For increased success, do not begin calling until completely ready, as many a fox has arrived with the hunter never anticipating such a quick response! Calling sequences start low and steadily increase in volume over a period of 20-30 minutes. If no action, move to another location and try the entire sequence again. Fox are nimble and extremely fast, so it should be no surprise that veteran hunters pursue them with shotguns, modified chokes and loads firing hevi-shot #2. As with coyotes, fox prefer approaching calling set-ups with their noses pointed directly into the wind, therefore having good visibility and shot options on the downwind side become critical. Field edges, railroad tracks and power lines all offer hot spots for chasing red this February. While hunting, be sure to keep your eyes peeled for other predators, as you sometimes never know what will respond to a calling sequence, bobcats on occasion have been known to investigate a fox calling sequence. Bobcat season runs from December 1st to Feb. 15th.